There Be a Cunning Dragon! - Joe Letteri, the Oscar-nominated vfx supervisor of The Hobbit: The Desolation of Smaug, discusses the fine art of crafting the dragon, those spiders and other visual treats of Peter Jackson's epic movie. Smooth Criminal - Toronto's ToonBox and Korea's Redrover tell the tale of a critter heist in the year's first new CG-animated feature, The Nut Job. A Toon of Love and Fury - Rio 2096, Brazil's entry in the Best Animated Feature Oscar race, explores the country's history and the transcendence of love through animation. This month, the cable network debuts Chozen, an intriguing new animated series about a white, gay rapper--and showcases a diabolically different new season of Archer. 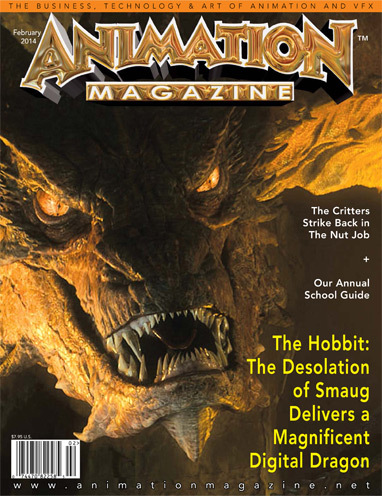 2014 School Guide - Listings for schools offering animation, fx and gaming programs around the world, plus special animation education editorial.